Mae Ya Waterfall A waterfall in Doi Inthanon National Park. Very large and beautiful. 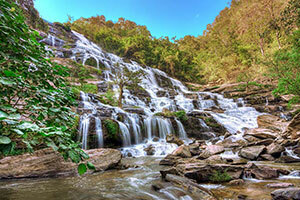 One of the top ten waterfalls of Thailand. Because of the water that flows down the steep cliffs 280 meters. Travel From the junction of Highway No.1009. Go for 1 kilometer, turn left for 14 kilometers and walk around 200 meters.